A great day for cross-country skiing at Kyburz Flats. Â Except for a few bare spots on the first mile of Henness Pass Road from the highway (could have driven that), there was a perfect amount of snow: just enough to cover and ski on, but no effort to break a trail. Â This route goes to the Â Wheeler Sheep Camp (Basque shepherder oven exhibit), then around the Flats and up to a nice high meadow. The weather started out foggy, but turned sunny. A walk around (pun intended) the Labyrinth Garden and Wilbur May Arboretum at Rancho San Rafael Park. 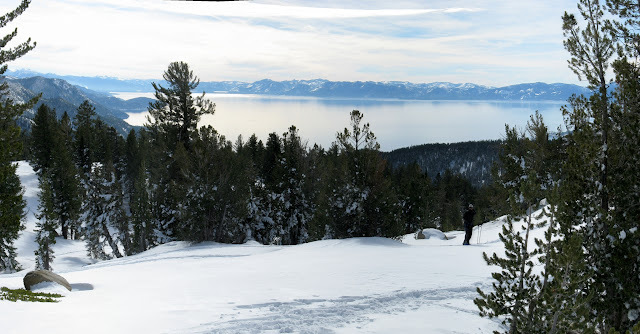 Taking advantage of our early snow storms this year, went snowshoeing at Tahoe Meadows. The usual fabulous views of Lake Tahoe.